I have seen the first two "Narnia" movies, but have not read any of the books. However, I have heard that they have condensed five of the books into the three movies, so I am assuming that they are not very similar. I enjoyed the first two "Narnia" movies greatly so I was hoping this one would be the same; unfortunately, it tends to drag a lot more and the plot was not as interesting. Edmund (Skandar Keynes, "The Chronicles of Narnia: Prince Caspian") and his sister Lucy (Georgie Henley, "The Chronicles of Narnia: Prince Caspian") are staying with their dreadful cousin Eustace (Will Poulter, TV's "School of Comedy") and their aunt and uncle while their parents and older siblings are abroad in America. It looks like their time there is going to be awful, until they are all transported back to Narnia, where they meet up with King Caspian (Ben Barnes, "Dorian Gray") who is on a quest. People have been disappearing, and he must find the seven swords, belonging to seven lords, and lay them at the Table of Aslan in order to restore peace to Narnia. Edmund, Lucy, and Eustace sail with him on the Dawn Treader, as they try to help him find the swords and battle the obstacles that get in their way. Maybe see this film. This movie was different from the previous two in that the two older children (Susan and Peter) were not really involved in it - there were maybe one or two scenes involving them, but they weren't a major part of the story. Also, the plot was a little tenuous, and I couldn't help thinking how similar this "Narnia" movie was to the Harry Potter films (their ship was very Hogwarts-esque and dragons were involved), but that HP was better. The film was screened for us in 3D, and although there is one cool scene where the 3D works really well, for the most of the time it seemed a bit choppy. I would recommend this film to diehard "Narnia" fans (tip: save yourself the money by seeing it in 2D) but keep in mind that you may be disappointed, as it was not as enchanting as the previous two. 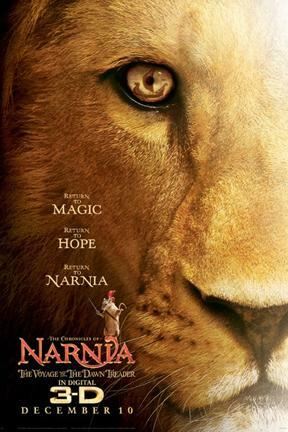 "The Chronicles of Narnia: Voyage of the Dawn Treader" will be in theaters on December 10th. You are too kind on this movie. I hated it. I would suggest that people don't see it in the theatre, and for sure don't pay for it in 3D. I am a writer/reporter for Narniafans DOT com, and I've seen quite a ton of reviews for the movie. The majority of them were quite positive, saying that the special effects were amazing, as was the character development and scenery. So I personally think this will be a fantastical movie (I'll be watching it in 5 days). @Shondira: Really? Have you seen the first two? I thought parts were good but during most of the movie I was bored. @Daniel James: Come back and leave your impressions after you've seen it, then. It currently has 63% on rottentomatoes, which isn't bad but isn't great, either. I much preferred the first two movies to this one. This movie put me to sleep. I loved the last Narnia movie. I havent seen the movie. kinda wondering if it follows the book faithfully.